Yesterday was just lovely. Fabric shopping in Birmingham on a beautiful sunny day with lots of creative and inspiring sewists. What a perfect way to spend a day. Let me tell you more..
About a month ago, Samantha from Create It Samantha and Bianca from Sleepless in Bavaria decided to host a fabric shopping trip and get-together in Birmingham. It sounded like too much fun to miss out on so I stuck my hand in the air straight away! We were all meeting in John Lewis, which was perfect as I was arriving by train and John Lewis is on the doorstep! Samantha and Bianca had thoughtfully arranged for us to have use of a private dining area next to the restaurant which was so perfect as we could all grab ourselves some refreshments and get to know each other before we started. During this time we had a little pattern/fabric swap. I was delighted to pick up a Colette Patterns Peony dress pattern. Thank you to whoever donated this item, I am thrilled with it! Further more Samantha and Bianca handed out goody bags for everyone. I will pop a picture of all our goodies at the end of this post. Totally spoiled already and we had only been going an hour! Firstly we met June who works for John Lewis in their haberdashery department. We enjoyed a lovely demonstration on their range of sewing machines, and had the opportunity to give them a try ourselves. I enjoyed using a machine with no foot pedal for the first time – it has a start/stop button instead, and quickly made a little quilted square. Such fun! Forgive that it is a little wonky, it was cut without ruler or measuring and not pressed, but you get the idea! After this, it was time to move outside into the sunshine and take a walk to the Rag Market. Plenty of bargains were bagged by us all as there were lots of fabric stalls inside and outside. No rest for the wicked, it was then off to a much anticipated visit to Barry’s Fabrics. Boy! we weren’t disappointed. Packed to the rafters with rolls and rolls of fabrics, we had a wonderful time, like kids in a candy store. By this time I think we were all beginning to flag a little. Perfect time to break for lunch. Of course lovely Samantha and Bianca had already reserved tables at The Stable, so it was a quick walk back to the Bullring area to grab some lunch. Two long tables had been booked which was so perfect as we could all continue to chat together as large groups and didn’t need to separate up into smaller tables. After lunch we jumped into taxis and made the 10 minute journey to visit the Adam Ross warehouse. We were warmly greeted by Jas, Faisal, Saira and the team, and enjoyed refreshments whilst we learned about the company and how they work. Did you know that Adam Ross offer free postage on all orders, and always aim to get orders cut and dispatched on the same day. Very impressive. If you would like to check out their website you can do so here. Jas took us over to their cutting table to show us their newest range of fabrics. We wanted to buy all of them! Next came the moment we had all been waiting for. A good look around their warehouse. Two enormous floors worth of fabrics. I have never seen anything like it, we were given free rein to take our time and wander anywhere we liked and choose any fabric that we wanted to purchase. The welcome that we received from the team at Adam Ross was second to none, and just when I thought our day couldn’t get any better we were each given beautiful little notebooks which had been bound and covered with their fabrics. I picked a navy blue with star design. Thank you so much to Bianca and Samantha for ensuring we all had the best day. Every little detail had been carefully planned, and not only was the fabric shopping amazing, the friendly company of such wonderful ladies and gent was a great experience. New friends have now been made and will be treasured. My fabric haul from the day. Top two from Adam Ross, middle from the Rag Market, bottom two from Barry’s Fabrics. Finally let me show you the lot! 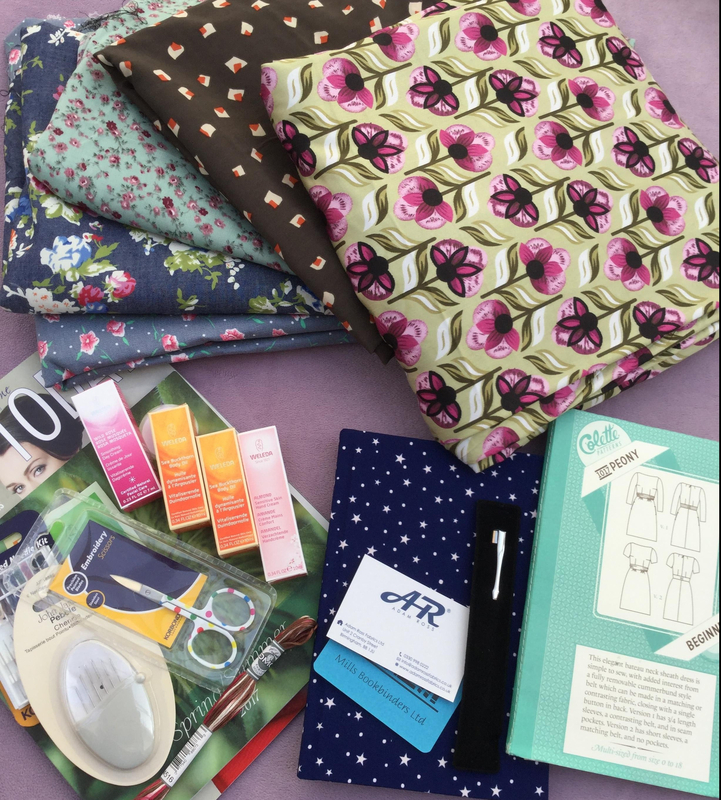 As well as the fabrics I purchased, take a look at the beautiful fabric bound notebook and pen from Adam Ross, and the extremely generous gifts from Samantha and Bianca. Also the pattern I picked up from the pattern/fabric swap! I think if this wonderful event is ever repeated, it might be wise to follow Vena’s example and bring a suitcase on wheels. We all had a bit of trolley envy at the end of the day when we had to carry our bags home! I hope you have enjoyed this little insight of my day out in Birmingham, it was lovely to meet so many new friends and hope to see more of you all in the future.